A door buster that’s never been as golden? The show’s success could not be impeded. Hamilton’s success and cultural impact are unprecedented for a Broadway musical. Yes, the uniqueness of its approach to a historical figure is a huge part of it. But none of that would matter without the hard work that went into building the audience for it. In fact, the idea for Hamilton was validated and iterated on no differently from how many startups have done it. This is that story. 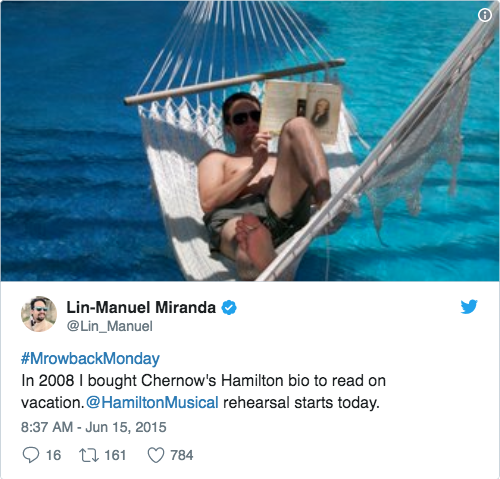 In 2008, Lin-Manuel Miranda bought a copy of Alexander Hamilton’s biography at an airport on his way to a vacation. Being a composer and performer, as he read the first few chapters, the seeds of Hamilton’s life as a musical were planted. Lin-Manuel's inspiration to make it a hip-hop musical came from a poem that Hamilton had written espousing his ambition to make a better life for himself. He connected the emotions of this poem to that of rappers he grew up listening to, all who used hip-hop as a way to write about their squalid circumstances and as a way out of them. While this characteristic of the musical is possibly its most unique, it stemmed from Lin-Manuel’s deep passion for hip-hop. It wasn’t a forced connection or a gimmick. Don't underestimate the role of passion and being consumed by an idea when deciding to pursue it. In Lin-Manuel’s case, it took him 6 years to bring Hamilton to stage. Lin-Manuel dove into researching the idea of a Hamilton musical. His first question: Did one already exist? To his surprise (because the idea seemed so obvious to him), none did. The closest thing he found was a play from the early 1900s . To round out his understanding of Hamilton, he dove into biographies of major characters  that impacted his life as well. He also met with the author of the biography that inspired him, who was skeptical that his book could be turned into a musical — until he heard Lin-Manuel sing the opening song that summarized the entire book . The first convert was born. Lin-Manuel first conceptualized this musical as a concept album called The Hamilton Mixtape. In May 2009 he had begun working on the first song. He received a call from the White House to take part in an Evening of Poetry, Music and the Spoken Word where he performed an early version of what would later become “Alexander Hamilton,” Hamilton’s opening number. In a recent interview, he revealed that at the time he performed the song, it wasn’t even completely written. He joked was that if a political audience wouldn’t resonate with a song (even if it was hip-hop) about Hamilton then he was likely in trouble. They gave him a standing ovation. The White House posted the performance on YouTube by and it went viral. Parody responses, video covers, college and high school performances, and other hip-hop songs about Hamilton surfaced. In fact, a common refrain Lin-Manuel heard was that history teachers had shared that video with their students. This early audience started clamoring for the rest of the Hamilton Mixtape. In May 2009, Oskar Eustis, artistic director of the Public Theater saw Lin-Manuel’s performance at the White House and begged him to work on Hamilton at his theatre. Lin-Manuel turned him down insisting it wasn’t a show. Lin-Manuel kept Oskar updated on his progress, however, sending him songs as he wrote them. All this did was keep Oskar’s begging streak alive for 3 years, with Lin-Manuel turning him down every time . The reason Lin-Manuel turned Oskar down was that he wanted to be open to inspiration. If he’d committed to Hamilton as a musical he’d have to worry about linking them all into a coherent story. As long as it was just a mixtape, they would just be a collection of songs . It had taken Lin-Manuel a year to write his first song. It took him another year to finish the second one . 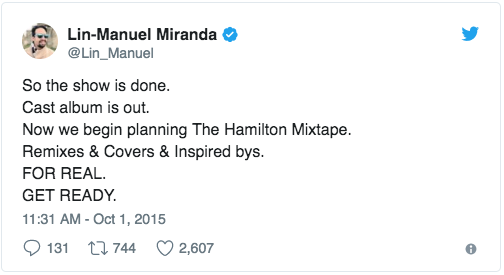 Three and half years later, in January 2012, Lin-Manuel performed songs from the work-in progress-mixtape for the first time. This performance included four other people. It got rave reviews further stoking demand for the complete mixtape. A second set of performances with more songs emerged in July 2013. This time nine performers accompanied Lin-Manuel. The anticipation was so great that both shows were sold out. Even the waiting lists were full . In the spring of 2014, after a series of conversations with Oskar, Lin-Manuel agreed to develop and premiere Hamilton as a show — “building in public” as it were, coincidentally, at a theatre called The Public . The existing buzz for the Mixtape was amplified with it becoming a show. 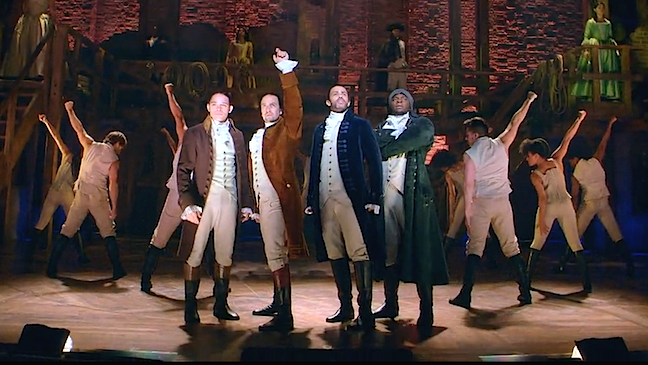 The response to tickets going on sale for the premiere of “Hamilton” overwhelm Lin-Manuel. The show went through various iterations, including one in which the show wasn’t completely sung and rapped from start to finish . On January 20, 2015, Hamilton premiered at the Public Theatre to rave reviews . In May, the show ended its sold-out 119 performance, off-Broadway run, attended by a swath of cultural and political celebrities . In July 2015, the show moved to the Richard Rogers Theatre on Broadway for previews before its official premiere in August. Despite its 15-week run at the Public Theatre, Hamilton hadn’t been seen by too many people— just over 34,000 seats were available during that time. Even though early signs were positive, there was uncertainty around how it would be received by broader audiences over a longer period of time. “The question we have to answer is: ‘Will the word of mouth be as good, or better, on Broadway? Will we measure up?’ ” said the show’s lead producer, Jeffrey Seller. There was also cause for worry because another show a few years earlier featuring another historical American figure, Andrew Jackson hadn’t done well . More recently a hip-hop show with songs by Tupac Shakur had flopped . These worries were quickly put to rest. Before the first Broadway preview, the show sold over 200,000 tickets ringing in one of the biggest pre-opening totals in history — $27.6 million! The demand for tickets was so high that Lin-Manuel, inspired by a practice pioneered by “Rent”, instituted a $10 ticket, day-of lottery for front row seats (i.e., #Ham4Ham aka get to see Hamilton for only $10). Over 700 people showed up hoping to be among the lucky winners of the first Hamilton lottery . The afternoon of the next show, Lin-Manuel inaugurated the first official #Ham4Ham performance. This was a fun way for the Hamilton cast to entertain the crowds, a couple of times a week, with one-of-a-kind performances, while they waited outside the Theatre to enter the lottery. The #Ham4Ham performances went viral on YouTube and across social media because it gave fans exclusive, shareable content. This generated even more interest in these street-side performances and the main show. Ironically, given the number of tickets the show had already done, it didn’t really need any viral marketing. Another organic benefit of these performances — a growing community of rabid fans. Super-fans of the show got all sorts of ways to connect with the cast because of the #Ham4Ham performances. They showed up for sing-a-long competitions and costume contests before the show. One fan, Howard Sherman, became a sort-of unofficial #Ham4Ham performance recorder. If he couldn’t make it, he’d coordinate with another supporter to see if she or someone she knew could record the performance . In January 2016, the #Ham4Ham lottery was moved online over growing safety concerns for the approximately 1000 people that showed up every day. More than 50,000 people logged onto Broadway Direct on the first day the lottery went online. This ended up crashing the site for all of Broadway . By now the fans had christened themselves “Faniltons”. They even came up with related hashtags for their “problems”. Unofficial Facebook Fan groups and Fanilton Tumblrs popped up, with one becoming a time-consuming side gig for a fan. Hamilton jewelry and other unofficial merchandise cropped up too. Fans also took to Genius.com and began annotating and explaining every line of every song. The Hamilton annotation project  has exceeded 200,000 words — making it 10 times larger than the show itself! A super fan, Elizabeth Ayme, joined Genius and quickly got promoted to project editor. As part of the project, they even got Lin-Manuel to annotate lyrics . He provided more context to the lyrics and upvoted other people’s comments about the songs. In-depth opinions, visualizations of the songs and lyrics also appeared regularly (even major publications like The Wall Street Journal and The New York Times got in on the act). Lin-Manuel took the important step of making himself an integral part of this community. His sincerity with answering questions to engaging with fans on Tumblr and Twitter displays his keen understanding of the role and power of the show’s fans. One of the most noticeable impacts has been that every Halloween, there's bound to be people in 18th-century garb. 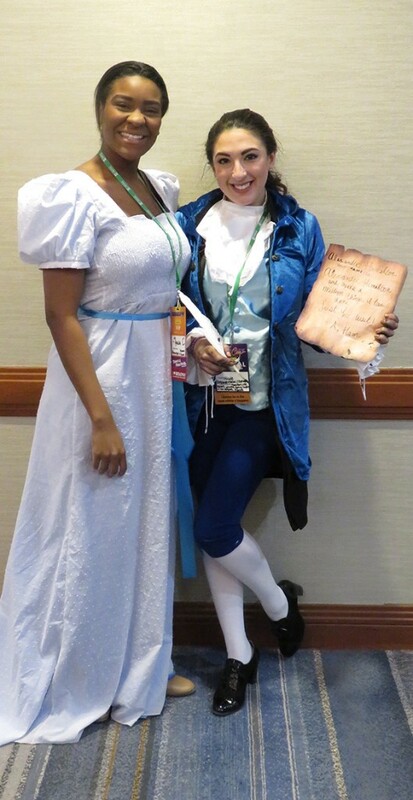 2016 saw the first #Hamilween which took on a new life in 2017. On a more educational note, history has never been more popular. Hamilton cast members visit to the Schuyler-Hamilton Mansion  in New Jersey led to a bump in visitors to a site that used to receive just a couple of visitors every month. Hamilton fans regularly post pictures of Hamiltonian history wherever they can find it. Even the Museum of American Finance saw an increase in visitors , especially younger-than-usual ones. This lead the museum to advertise in the show’s program. 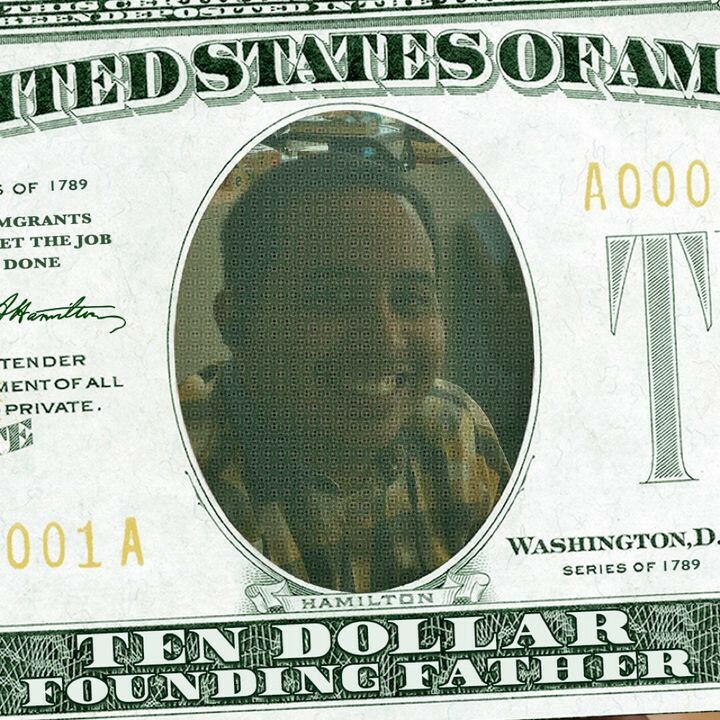 The U.S. Department of Treasury also announced in December 2015 that it would delay its plans to remove Hamilton from the $10 bill after fans protested . In September 2015, the Original Broadway Cast recording of the music was released. It debuted on the Billboard 200 chart in late October at #12, the highest for a cast recording. By November, It was also the best-selling album on the Rap charts, a first for a Broadway cast album. With the recording, fans got a way to re-live the emotions they felt during the show. Being able to hit repeat allowed those emotions to deepen their connection with the show. “The music fuels the addiction to the community and the community fuels the addiction to the music,” says musicologist Thomas Peach. Nicole Dieker of Popular Science wrote: “Those of us who tag ourselves as #hamilfans or #hamiltrash spend as much time talking about Hamilton and making Hamilton-related art as we do listening to the music”. A musical inspired by a book inspired its own book. 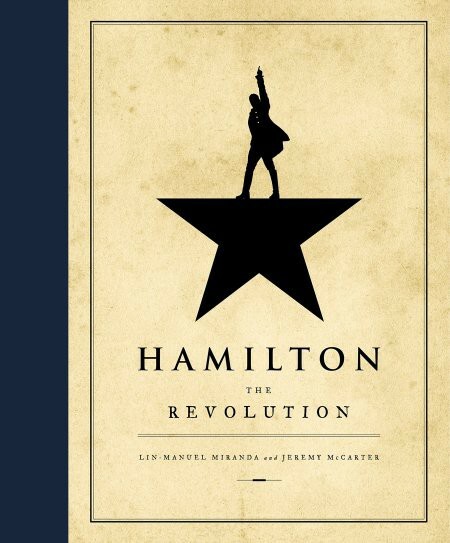 In April 2016, Hamilton: The Revolution (affectionately referred to as the Hamiltome), co-authored by Lin-Manuel was released and promptly sold out . It was ironic how an idea that started out as a mixtape and evolved into a musical came full circle. Interest in the mixtape spiked once Lin-Manuel revealed his collaborators for the mixtape. They included some of music’s biggest stars and up-and-comers who reimagined many of the show’s songs. It debuted at #1 on the Billboard 200 in December 2016 . This gave the musical’s fans another way to experience the show. At the same time, for those that hadn’t yet heard the original songs, their favorite artists acted as hooks to begin their journey of discovery. In June 2017, “The Hamilton Instrumentals,” the instrumental edition of the Broadway cast recording show was released . At the same time, the show producers officially endorsed fan sing-along events that had begun to take place around the USA . Encouraging the sing-alongs made perfect sense because these events only stoked fan enthusiasm for the show. The timing was perfect as well because the show was also touring the country. The app allows people to experience Hamilton in different ways and give fans new ways to engage with the musical. A second production celebrated its opening night in October 2016 in Chicago. And yes, the #Ham4Ham’s are popular in California too. Following a couple of months of previews, a London production opened in January 2018 to rave reviews. Like Chicago, London has an audience with a long history of theatre patronage and is a perfect choice for a residency. The soundtrack has also helped Hamilton gain traction worldwide. International fans have enjoyed analyzing the lyrics and their connection to current events in the USA (along with Hamilton’s intriguing love life). It’s only a matter of time before other international residences or touring productions are on the cards. Perhaps the best perspectives that summarize this come from forces inside and outside the musical. In many ways, it’s easy to see similarities between Hamilton and another touchstone of popular culture — Star Wars. Even the story of how a nobody and a ragtag team of fighters overcame insurmountable odds to fight for control over their future is similar. The community and following surrounding Star Wars is legion. Fans will take any opportunity to dress up as their favorite characters and spout lines from the movies. Memes and memorabilia abound. Parents who grew up on the original trilogy take their kids to watch the newest episodes. The circle of discovery and rediscovery is never-ending. Hamilton is the first Broadway musical to inspire the adoration and sense of belonging generally reserved for popular myths. The last song of the musical is titled “Who Lives, Who Dies, Who Tells Your Story”. In Hamilton’s case, it seems, the story will be told and re-told by generations of young, scrappy and hungry fans who feel like this is a movement that inspires them to take their shot. However minimum your MVP is, the distinctiveness of your idea must be apparent without effort. How you communicate the value of your product is as important as the product itself to understand how it’s going to resonate & with whom. Involve your audience as you iterate. Be open to user feedback but balance it with your own convictions and vision. It’s never too early to build and engage with a community around your product. Word of mouth is your most sustainable growth engine. Once you’ve nailed the core experience, look for opportunities to deepen user engagement. Repurposing the core experience within different channels or formats allows for new or casual users to discover the core experience. A slightly different one this time. Our growth studies have generally focused on online companies. I was inspired to dig into Hamilton because of its outsized impact in the world of broadway musicals. On closer examination, I found that at every step of the way, the show iterated and built on what came before much like a tech startup. Hamilton's growth has lessons on everything from creating an MVP, leveraging unfair advantages, pivoting, finding your target audience, virality, creating 10x content, repurposing content, community building and scaling. I had no idea that it all started with an MVP. Ha. Great research + great post. Lots of lessons in this one. I'll be coming back to read it a few times over the coming weeks. Also sharing with my team. "What was the MVP for this?" was literally my first question after watching the show (talk about becoming a growth nerd). I couldn't fathom how you could communicate the magnitude of its vision with something small. Fair to say I was surprised as well at how small the beginnings were. It was a great re-learning about how easily a well-made MVP can communicate its core value and the sort of delight it should evoke. This is fascinating, Anuj! Many thanks for sharing this. Really had no idea about this massive success story. It is interesting to draw parallels between the initial sneak-peak performances that Lin Manuel gave and a product beta in a business sense. Only once he seemed confident about the "product", the "market", and the "manufacturing process", did he go full-throttle at "building the product". Also, very pertinent point raised when you outlined the importance of supplementing the core experience with other channels of user engagement. This merely fortifies the brand-customer connect, also setting in motion another wave of positive word of mouth. And you're absolutely right about the importance of supplementing the core experience - I think they've been incredibly opportunistic & smart about it and the results are apparent. Watching Lin Manuel from when IN THE HEIGHTS first came to Broadway and became, what I consider a massive sleeper hit for that particular season on Broadway. I couldn't wait to see what would come from Lin Manuel and his money team of Musical makers. But.... HAMILTON! I never dreamed it in a million years. So smart. So needed without us knowing it was needed. Kudos to Lin-Manuel and team! Best part for me is the idea that HOW you communicate the importance of the product you are selling is AS important as the product along. You gotta have both to be a smash!